Yes, the photo is blurry. That's because the train is going at about 357 miles per hour, setting a record for the fastest ever. 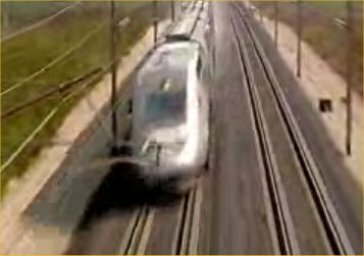 It's the French Train Grande Vitesse and it's a marvel of rail technology. This month's speed problem is also the fastest ever; though very easy and far from a checker marvel, it's a test of checker intuition. The trick will be to spot the solution within the allowed time limit. 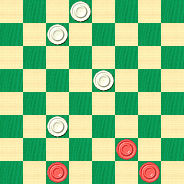 This is a "solve at a glance" problem for a player with even moderate experience. But if you're a newcomer to our game of checkers, you may take a little longer to see how it's done. That's fine, too; it's the process of looking for a solution that's important. Here we go: click below and think fast! Then come back and click on Read More to see the easy answer to our "fastest" ever speed problem. 3-7 11-2 1-5 2-9 5-32 and Black wins on the move. A simple in-and-out shot. How would you analyze this on a fundamental basis? Look at the lineup of White men on 18 and 27, just waiting to be double jumped. Then you think, hmm, if I had a man on 5 and if I could pull a White man to 9 ... and off you go with seeing the solution.